What do you get when you mix a thin, pretty, young, celebrity model (from the Kardashian brood no less) with a corporatized imaginary protest? If you guessed trash, congratulations. That’s what Pepsi gave us. You also get a glimpse of the image many white people have in their minds of corporations, consumers, and social issues. And, it’s a major problem. Yesterday, the calorie producing mega-corporation released an ad depicting a glammed up Kendall Jenner posing in a fashion shoot when she is surprised by the protest happening right outside her door. Clad in a blonde wig, stiletto heels, and dramatic makeup, she becomes concerned about what’s going on – even though it looks more like a parade than a protest. At that moment, an attractive Asian guy with a guitar nods his head at Jenner, inviting her to join the demonstration. Seeing that this was clearly an opportunity to insert herself in all of the things, Jenner rips off the wig and throws it at a random Black woman on the steps. She brushes off her lipstick and takes to the streets. Somehow, in a few seconds, she is wearing form-fitting denim and perfectly coiffed brunette tresses. She walks through the crowd – making sure to give “Pepsi dap” to the Black guy with cornrows on the way. 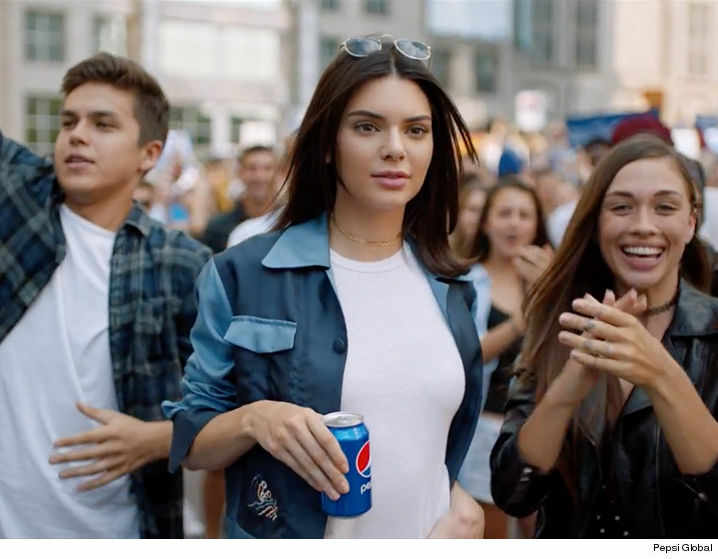 Wondering how to solve all of the world’s ills with just a Pepsi can and medium-level pretty, Jenner realizes that the cops who are standing around are clearly just thirsty. That’s why they have made a barricade. Thirst. She saunters over in her high-waisted jeans, handing one cop a Pepsi. He cracks it open and takes a sip. Just then, the crowd erupts in celebration because apparently this was an anti-Coca Cola protest not an anti-state sanctioned violence one. Good thing for that, amirite? Luckily, there is a darker-skinned woman in a head wrap – who we are to assume is South Asian – capturing the entire experience on her camera. That’s the ad. Once again, whiteness saves us all. generally fails to do address anything having to do with actual movement work. Further, as Taryn Finley rightly pointed out, the ad is just tone-deaf, shallow, and over-produced. I cannot and will not disagree with any of that. took all my rights away….telling me how to pray…won’ t let us demonstrate. We are the lions. We are the chosen. We gonna shine out the dark. We are the movement. This generation. You better know who we are. These musical lyrics reek of well-meaning white liberal self-importance and no substance. But, they are indicative of the ad itself. There’s just nothing there worth taking it seriously. Pepsi thinks “it’s an important message to convey” though. So what do we know? What stuck out most to me was the consistent theme that so many white people possess: that, somehow, if people of different backgrounds, marginal statuses, and positions of racial and power privilege just share a beverage, everything will work itself out. This was the case a few years ago when Beer-gate happened, leaving Dr. Henry Louis Gates forced to have a beer with President Obama and the cop who arrested him in his own house. This is a latent understanding of repression in the United States. It rests on the ideas that the issues people have with this country are personal and interpersonal rather than systemic, institutional, and structural. It also inserts corporations, like Pepsi, into a fight for justice. This is a fight that they clearly have no interest in except where it concerns their profit margins.Consumerism in the face of trauma. That’s the message we get. Apparently, rather than confront America’s issues with actual solutions, we should drink carbonated syrup together. Increasingly, lay citizens and public officials alike have endorsed larger responsibilities for private industry in addressing issues of social democracy. They endorse private ownership of prisons and schools, gentrification in communities they have disinvested from, and even applaud companies like Wells Fargo which makes money off of the exploitation of poor Black and Brown people only to pretend to care by encouraging homeownership amongst the same demographic. Remember when Mitt Romney said, “corporations are people, my friend”? Well, sadly, the United States government continues to treat them as such. Many white people – who are not directly affected by the negative consequences of corporate personhood – are totally okay with the status quo. This commercial can tell us a lot about how most white people view police violence and the militarization of poor, Black and Brown communities. It can also tell us how capitalism (and more specifically neoliberalism – a form of capitalism which commodifies everything) is inherently oppressive, erasive, exclusionary, and harmful to the least of us. So, maybe Pepsi is right. It is an important message to convey, just not in the way they think. August 30, 2016 Did The 2016 VMAs Commodify or Celebrate Blackness?